You guessed it! Another hill. . .there are inumerable hills in New Zealand and I seem destined to attempt to climb them all. To get to this one we drove north on highway 1 to the intersection with highway 58 to Upper Hutt, just before the bridge that goes into Mana (==power, prestige). 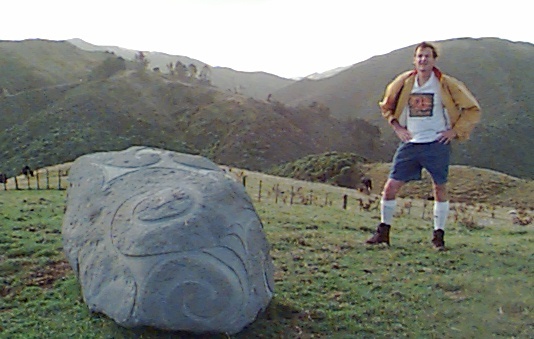 About 6 kilometers west we reached, and turned north again on, Paekakariki (pae==ridge, kakariki== parakeet) Rd. It was about 6 killometers later that we reached the start point for the ascent. Battle Hill is so named for a brief skirmish that occurred here during the Maori wars. 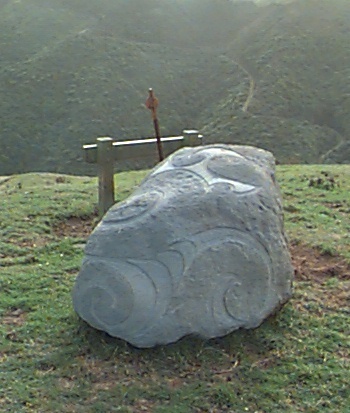 On the 6th of August 1946, a military unit approached an Maori stronghold at the top of the hill to resolve a land dispute. 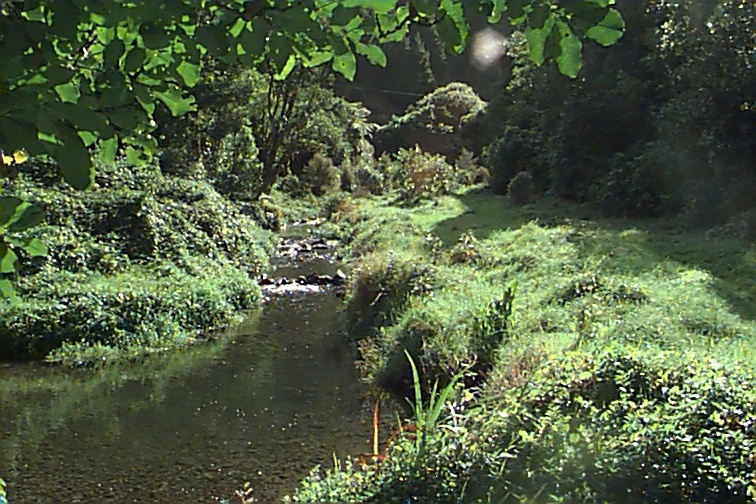 The New Zealand Company had purchased land in this area but the purchases were disputed by Te Rauparaha and his nephew Te Rangihaeata. To resolve these disputes an armed force was sent into the area and a skirmish occurred at what is now called Battle Hill. Three militia men were killed in the unsuccessful attack by the colonialists, two of whom are honoured in a memorial near the base of the hill, where they are buried. In a more peaceful use these days, the area serves as a working farm and park which is used to teach school children about raising sheep. A few trails have been laid out for climbing, horseback riding and for mountain bike riding (a particularly perverse form of exercise which is much favoured in N.Z.). 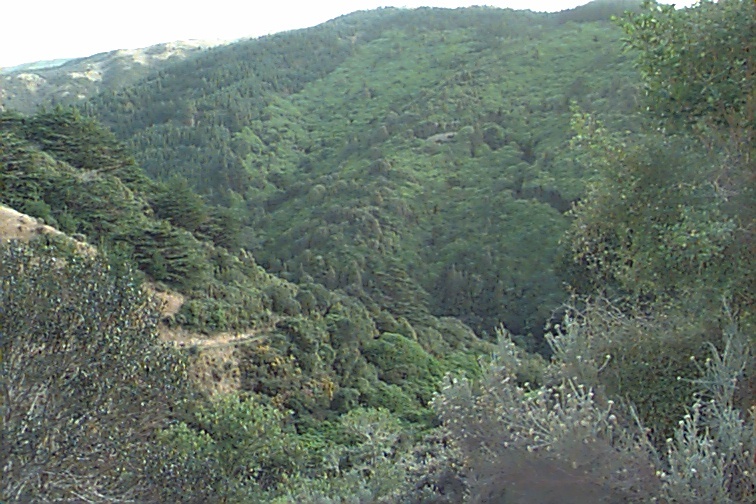 We followed the climbing path to go to the top of Battle Hill where the Maoris had created their defensive position. The first part of the route (which our trusty navigator had us do in reverse direction so that we could benefit from the steepest possible ascent) was along a gentle incline which ran along the banks of a creek and through some fairly verdant growth which is very typical of the treed areas that we often climb through. 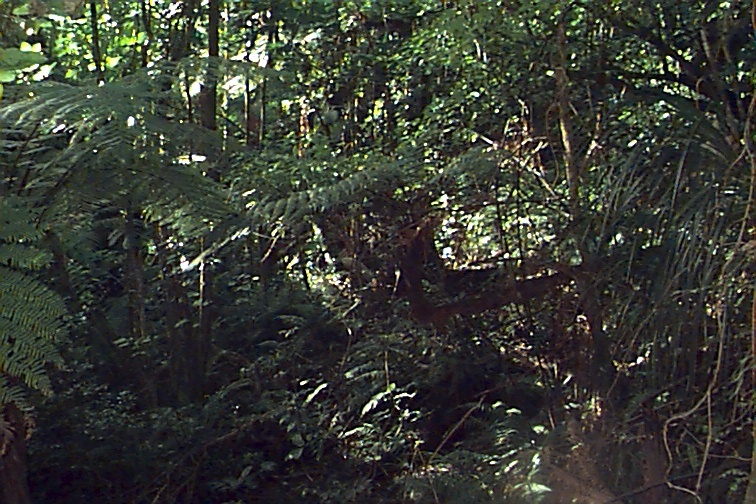 In the center of this area was one of the tree ferns that are so plentiful. In all, New Zealand has about 180 varieties of ferns. But soon the lower creek gave way to the ascent. About half way up we could look back and see the trail we had been climbing as we broke out of the trees and onto the hills which were populated by the ever present sheep. The trail is visible as a deceptively horizontal line about one third of the way up on the left part of the picture. Later (notice how quickly I climb these hills now) we reached the top, the Maori stronghold. The Maoris very quickly adapted to warfare with the English and typically created palisades around the tops of hills with trenches and other construction, which were virtually impregnable. The Maoris acquired firearms early on and the terrain was almost impassable for artillery which was the only weapon that could quickly subdue these structures. At the same time English forces were small and could not create effective sieges. 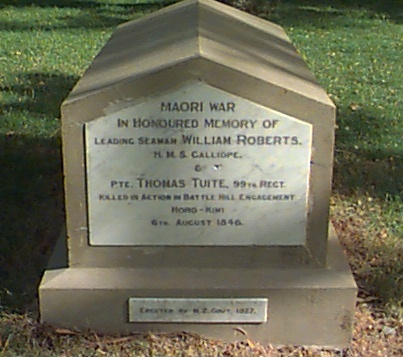 If attempts were made to bring in artillery, the Maoris could generally evacuate without significant losses. This hilltop is beautifully located for defence. It was well inland without road or river approaches that could be used for quick approach. The view to the south, in the direction of Wellington is superb. To the west the view is not as distant but also shows the defensive strength of the position. 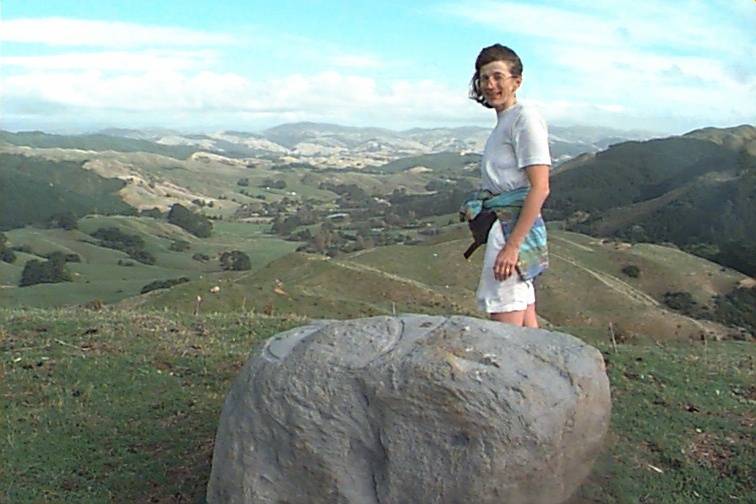 The rock in the foreground displays Maori carvings, but there is no indication of when it was placed there or carved. All that was left now was the gentle descent down the path that most people climbed. 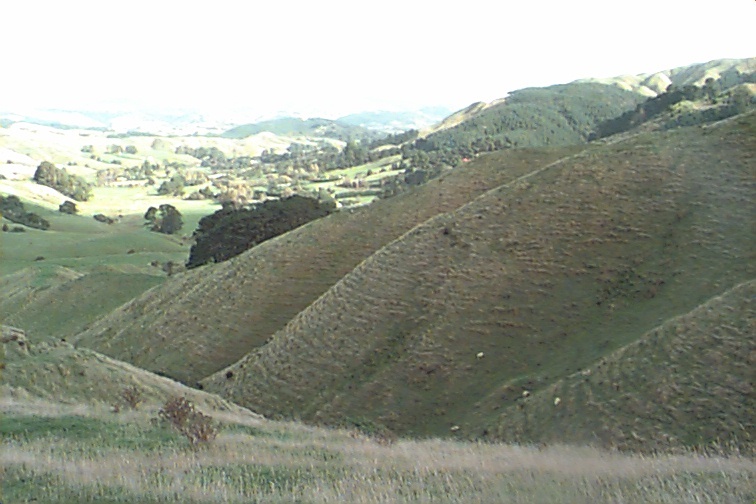 This path was through sheep pasture and the white dots in this view to the south, taken about half way down, are sheep.